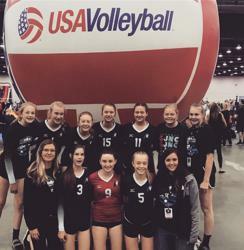 Momentum 15 Elsa finished their season on a high note placing third overall at USAV Nationals in the USA division. A well deserved finish for this group of freshman (and one eighth grader) after a hard fought tournament. They finished with an overall 5-5 record, which might be a surprise given their 3rd place finish. This just speaks to the importance of coming together as a unit at the right time, and winning the "right" matches. They started out their first round of pool play with a 4th place finish, just squeezing their way into the upper division. The first match of round two pool play versus the later champions, Vegas Aces, was not very promising for Momentum 15 Elsa, losing in two quick sets. The team showed a great amount of character, resiliency, and determination by bouncing back in the very next match, defeating the Flyers in three tough sets. This set the team up to still have the opportunity to go for the gold! After being mentally and physically exhausted from the morning pool play matches, the team relaxed and let loose a little by enjoying lunch and a good dose of vitamin D on the river walk. The girls especially enjoyed playing around in the water fountain (with all of the local toddlers), with Canada In the background. Later that evening they played one of the best matches of the season, taking down St. Pete in a challenge match to get into the gold bracket. 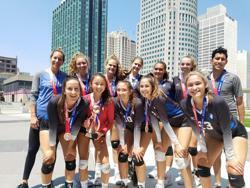 With gold in their sights on the final day of play, they competed back and forth for three sets with Skyline and finished with the W by just three points. Finally, their road ended after meeting the later runner up champions, Epic, in a two set match. It was definitely a tough way to finish, after the success the team found throughout the tournament, and knowing it would be the last time the core group of girls would play together. There were lots of bitter sweet tears shared among the team, coaches, and families. The awards ceremony brought great joy again as they were dressed with their bronze medals, and trophy. Not to mention, two players who earned spots on the All-Tournament Team, Charlee Cordts (L) and Kaitlyn Winkleman (S/RS). Overall it was an amazing experience that will never be forgotten. It was truly an ultimate team effort, as players stepped up for each other and the greater good of the team when needed. Detroit was good to Momentum 15 Elsa, and will always have a soft spot in their hearts. Rocky Select 18 Jackie earned a USA bid to Junior Nationals at the Northern Lights qualifier. The team had competed well in Kansas City but lost a major contributor on the 2nd day with a season ending injury. The team had 2 weeks to prepare for Northern Lights with a pin hitter stepping in to play middle to help the team achieve its goals of qualifying at a National Qualifier. The team played selfless team volleyball stepping up at the right moments to earn a bid to Anaheim. 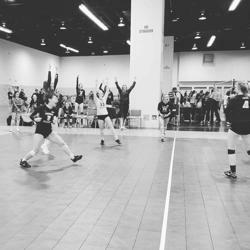 The team signed 9 seniors to go play college volleyball and looked forward to competing at Junior Nationals as their last club tournament. The team competed on the court but made more memories that they will remember for the rest of their lives. At the Rocky select end of season banquet the team was able to sign pictures and the club recognized each player individually for their hard work and dedication. 14Matt qualified in the USA division by earning a bid at the Reno Qualifier. Their team had an extremely tough day one pool; 3 teams from the day one pool ended up finishing in the top 5 once everything played out on day 4. This team played great defense and passed extremely well the whole weekend. They won several hard fought matches because of their terrific ball control and precise serving. After all of the dust settled, 14Matt ended up as the Flight 2 champions! They are all going to be well prepared as they head into their respective high school seasons! 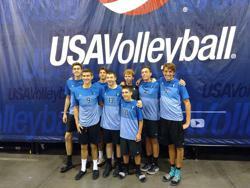 Momentum 18 Sanchez were proud to compete in the inaugural year of the added USA division to BJNC! We knew we were going to have some tougher competition in the USA division. We ended with a 5-4 record. While we didn’t achieve our team goal of “winning out” at Nationals…we were very proud of being able to compete at the next level of play! In Phoenix, it was sooo hot! We would have team bonding at the pool at 9pm when it was “only 99-degrees” outside. The boys made friends with a 14’s team from Cincinnati Attack and had a volleyball match in the pool! The 14’s really enjoyed the camaraderie of our 18’s! 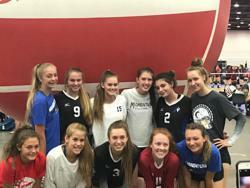 Norco 18 Blue started its season in November with nine girls. The team competed in the highest division (mixed) for every power. Throughout the season, 18 Blue continued to develop. In both the Kansas City and Nashville tournaments, the team played in the gold bracket on the final day. And at Colorado Crossroads, the team finished second in the USA division to get a bid and qualify for Nationals in Anaheim at the end of April. Many of the girls on this team have played together for several years. Taylor Rohr and Julie Ward were the team captains this year and did an excellent job in leading their team. 18 Blue traveled to Anaheim this weekend to compete at Nationals for one final time this season. The team competed in the USA division. The team finished first in Flight 1A to end the season. Not only did the girls get to compete at the highest level in Anaheim, but they got to vacation at Huntington Beach, ride roller coasters at Disney Land and pig-out at Joe’s Crab Shack. Seven out of the nine athletes will go onto to play at the next level. All of us at Norco wish them the best of luck on the next chapter of their lives. Thank you Norco 18 Blue for letting us be a part of your journey. 17Bri qualified in the USA division by winning the Northern Lights qualifier in May. The team had a slow start but continually improved their level of play as the tournament progressed. 17Bri finished in 5th place in their first pool of the tournament by beating PVA 17 Elite. Day two proved to be a great day for 17Bri. They went 2-0 and finished first in the day 3 pool. That moved them into flight one on day 4. Their only match on day 4 proved to be a battle as both teams wanted their seasons to continue but 17Bri was on the losing end of the three game match, 15-13. Momentum 13 Vanessa punched their ticket to the 2018 Girls Junior National Championship by winning the 13USA division at the Show Me Qualifier. Though this team worked hard to prepare for Nationals, the 13 USA division featured a very talented and competitive field of 24. From the first whistle to the final one, 13 Vanessa struggled to find their usual rhythm which left them battling for 20th place on Day 4 of the tournament. Though 13 Vanessa did not accomplish their goal of a top 12 finish, the team built character by battling through the adversity and being challenged to work hard for every single point. At the end of the day, the wins and losses fade, which is why 13 Vanessa looks back on this tournament as a pivotal character building and learning experience. More important were the memories made as a team while cheering on Momentum 12 Kia and 16 Rachel, making friends with another team competing in the 13USA division at our End-of Season dinner at Z’s Villa, and our send-off for one of our players whose family is moving to Arkansas. Though we hoped for a more successful tournament, Momentum 13 Vanessa proudly represented the RMR and Momentum Volleyball Club at the 2018 GJNC. 16 Rachel started in a tough 6 team pool for Day 1 and Day 2 - this pool included the USA division champs, A5 Mizuno. On Day 3 we beat Top Select Adidas 16 Elite ensuring us a shot at the gold bracket. Heading into our challenge match, we knew it was going to be tough. Playing some of the best volleyball this team has ever played, we lost 25-23 in both sets to a very good team. This team left everything out on the court that day and left the gym feeling proud. Day 4 landed us in the silver bracket and ended our journey here at GJNC with an 11th place finish. We spent our last tournament enjoying our time in the team van, checking out Canada from the lakefront, enjoying some great dinners, and bonding whenever we had the chance. After such a successful season, it was amazing to end on a high note with a top finish at nationals and a top finish of the teams in our region. The 2018 Girls Junior National Championship for The Diff 17 Black was a great success. None of the team or coaches had ever been to Detroit before and it was exciting to see a new city. The Diff 17 Black played in the USA division competing against many great teams from across the nation. The play in the RMR region was very helpful in preparing these players to compete on a national level. Finishing 21st overall, in the bronze bracket with a 5 to 3 record. The 303VBA 16 Neo team concluded their great season at the 2018 BJNCs in Phoenix, AZ with a 5th place finish in the 16 USA Division. The team had earned a bid to the BJNC by winning the gold medal at the Dennis Lafata Gateway Championship in St Louis, MO. In the first round of pool play, 16 Neo swept Balboa Bay 16 Black and Prevail Boys 16U in straight sets. The boys lost their last match of Day 1 to Adversity Adidas 16 Purple to finish 2-1 on the day and to break up into the upper division. Adversity ended up finishing 2nd overall in 16 USA. Day 2 was filled with drama and excitement as 16 Neo won their first two matches against LVC 16 Black and Sports Performance 16 Alpha in 3 sets each. They ended up losing their third match to SAS Boys 16s to finish 2-1 again, and continue to stay in the upper bracket. SAS ended up winning the 16 USA division. Day 3 placed the boys in a 3 team pool needing a first or second place finish to make it to the Gold Bracket. The boys won their first match against MB Surf Asics 16s in a thrilling 3 set victory - 27-25, 24-26 and 18-16. The boys lost their last match against Balboa Bay 16 Black, but because Balboa Bay had beaten MB Surf in the previous match, the boys were assured of a spot in the Gold Bracket. Balboa Bay 16 Black ended up finishing 3rd in 16 USA. In the Gold Bracket, 16 Neo faced Coast 16 Black and lost a heartbreaking match, 22-25, 25-22, 16-18 to finish tied for 5th. Coast ended up finishing tied for 3rd as well. The 5th place finish was the highest ever for a 303 team at JNCs, with the boys’ only losses coming to the teams that finished 1st, 2nd and two teams tied for 3rd. It was a great team performance, and a memorable experience for all. And to cap it off, Karter Rogers was named to the All-Tournament team, another first for 303VBA.